At Dolphin Discovery, the Dolphin Swim Adventure provides a unique opportunity to interact with dolphins in a swimming pen. The dolphins are trained to give kisses, hugs, and handshakes, and will even swim backwards while pulling you by their fins. Children and adults alike can sign up, so don't wait! Dolphin Discovery is a tour service with several coastal locations that offers a variety of packages for swimming with dolphins. The packages vary by time, cost, and activities, but each one will offer the exciting chance to interact with an Atlantic Bottlenose Dolphin. At our Tortola location in the British Virgin Islands, we offer full-day packages as well as smaller tours. 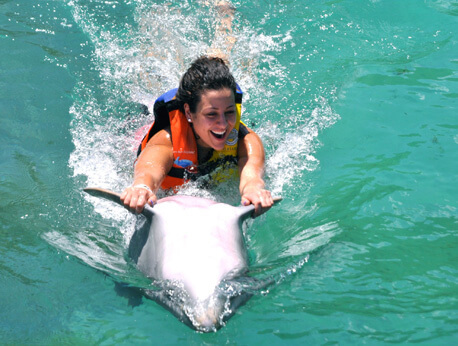 One of the most popular tours in Tortola is our Dolphin Swim tour. The Dolphin Swim tour is offered daily and runs from 11 a.m. to 1 p.m. A boxed lunch is included as part of the tour package. During the Dolphin Swim tour, children and adults alike will be able to interact with dolphins in a swimming pen. The dolphins have been trained to perform a variety of behaviors with the swimmers. These behaviors include shaking hands with the guests, giving kisses, and hugging. Their tricks include the boogie push, the hand target, and the belly ride. The dolphins will even perform a song for the swimmers. Perhaps the most popular behavior is what is called the "belly ride". During the belly ride, the swimmer can grasp the dolphin's fins while the dolphin lays on its back and swims with the rider on its belly. If you plan to take a Dolphin Swim tour, don't forget to make your reservations. Each child must be accompanied by a paying adult. Tour groups have a maximum size of 12 people per group to ensure that every participant has a personal experience with the dolphins. It is required that all participants wear a lifejacket while participating in the tour. These jackets will be distributed at the time of the tour. Participants will also have the opportunity to eat their boxed lunches. Restroom and shower facilities are made available to guests on the tour. The Dolphin Swim tour is an exciting chance for children and adults to swim with dolphins! Children are 3'11" to 4'6" and must be 8 or older. IMPORTANT: a valid passport is an essential requirement to visit Tortola in the British Virgin Islands. In Tortola, groups have a maximum of 12 people for a closer experience.